Question 7: Last month, the balance in Tisha’s checkbook was $1219.17. Since then she has deposited her latest paycheck of $2425.66 and written checks for $850.00 (rent), $235.89 (car payment), and $418.37 (credit card payment). What is the current balance in Tisha’s checking account? Question 8: Byron purchased a $5,000 certificate of deposit (CD) at his local bank. The CD will pay him 7% simple interest. How much INTEREST, in dollars, will Byron have earned from his CD at the end of a 2-year period? Directions: Select the one best answer to each question. Maggie borrows $10,000 for her business at 10% simple yearly interest. She will pay it back over 2 years. If she pays 24 equal monthly payments, how much is each monthly payment? A painter rented a wallpaper steamer at 9:00 am. He returned it at 4:00 pm. He paid a total of $28.84. What was the rental cost per hour? Annie is planning a business meeting for her company. She has a budget of $1,325 for renting a meeting room at a local hotel and providing lunch. She expects 26 people to attend the meeting. The cost of renting the meeting room is $270. How much can she spend on each meal? 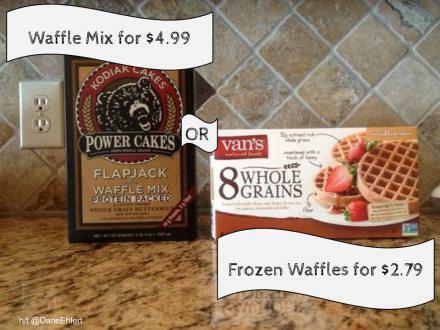 Buy a package of frozen waffles for $2.79? Whichever option you choose, please justify your reasoning with mathematics.